Some people recycle their beer bottles. Some people cash them in for a deposit. Those people are suckers. It's time to treat your recycling bin full of beer bottles like the beautiful treasure chest it is. With a little bit of elbow grease and tools you can easily steal from your neighbor's shed, you can spin those beer bottles into useful home goods like wine glasses, wall art, and even chandeliers. Here are the best uses for empty beer bottles. 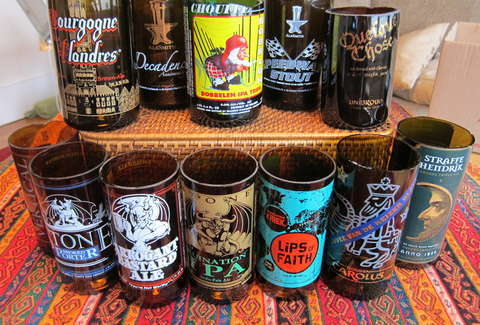 Easily (and safely) cut off the tops of beer bottles and turn them into pint glasses thanks to YouTuber Jonny Keeley. Weirdly, your sink is a huge part of this process. You'll alternate pouring boiling-hot water from a tea kettle and cold water from your sink on the bottle until the neck pops off! Other how-tos that teach you how to do the same thing require the use of fire, but not Mr. Keeley's, saving you from unsightly burns. Now that you know how to hack a bottle in half, you've gotta find a use for the neck. Imgur user klarrieu recommends making shot glasses. Then you can drink a shot from the same vessel you previously had beer in. It's basically like Christopher Nolan is tending bar. Do you own a drill and know how to use it? Then take it to some bottle caps, and you've got instant tops to salt and pepper shakers. Instructables provided us with that clever tip, which can be seen in action at breweries all over the country. Grab some fuel, gravel, and a wick from a hardware store, and you can light up your backyard with boozy Tiki torches. Never stumble blindly around your backyard at midnight again, especially when it's so much more fun to stumble around at midnight when it's lit by torches! Strangely, this fantastic YouTube tutorial was created by cleaning product maker Wet & Forget. Some of the art covering your favorite craft beer is phenomenal, so why wouldn't you want to display it? That's what the folks at Thirsty Bastards were thinking, so they figured out a way to remove beer labels without damaging them. The removal process depends on what type of label you have (it could involve baking or soaking it off), but once it's removed, they recommend plastering it on a piece of tile for a fancy coaster, or just scrapbooking 'em. A perfect project for the truly lazy to feel a little crafty, dig up some bottle caps from the bottom of your recycling bin and glue 'em to your coasters. Thanks for making us feel artistic, Daily Targum. Once you separate the neck from the rest of the bottle, you can turn those parts into a fancy-looking wine glass. The smart bros (as in, they are actual brothers) behind YouTube channel Cottage Life DIY call it a "hillbilly wine glass," but it just seems like a genius wine glass to us. Washing your hands after using the bathroom is so boring. Welcome to Yawn City, population you! Luckily, after reading School House Booze's quick tutorial, you'll be psyched to kill those germs after you spray-paint a beer bottle and equip it with a soap pump. Bed Bath & Beyond, consider yourself served. Nick from Bottle-Lamp.com suggests you buy a chandelier on the cheap at a thrift store, drill holes into beer bottles, and then clamp 'em to it. This sounds much smarter than building a chandelier from scratch. See how your chandelier can look better than what's in most people's boring dining rooms. You and your roommates are going to need to start drinking more beer, but once you have thousands upon thousands of bottles, do as the geniuses on Prince Edward Island in Canada did and build three houses. Once you build one house made entirely of beer bottles, don't stop there… you still have two more to go! Lee Breslouer is a senior writer for Thrillist, and needs to make those s&p shakers. Follow him to too much salt: @LeeBreslouer.